A Japanese TV station got in hot water a while back for making unsupported claims about the weight-reduction effects of natto (fermented soy beans). The broadcast triggered a buying frenzy (which was perhaps the intent?). 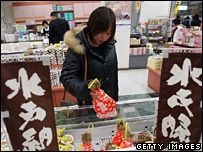 A natto shopper weighing her buying options.